NV Microlaser is a cordless diode laser designed to deliver laser energy in either a continuous wave or pulsed mode. The laser features an LCD screen for selecting modes, pre-set procedures, aiming beam and beeping volume. Each non-sterile, disposable fiber tip is individually wrapped and is pre-scored and pre-stripped. The unit contains a magnet, which snaps the tip into place and aligns the tip with the laser aperture. When the tip is connected, there is a visual verification indicating proper attachment. The tip can attach in six different positions allowing the user to reach difficult areas during procedures. The foot pedal is battery-powered and wireless, powered by two AA batteries. NV Microlaser is intended to be used for oral soft tissue surgery, including sulcular debridement of diseased fibrous tissue, gingivectomy, gingivoplasty, lesion (tumor) removal, fibroma removal, tissue retraction, aphthous ulcers, gingival hyperplasia (excision and recontour), crown lengthening, operculectomy, frenectomy, and photocoagulaton. 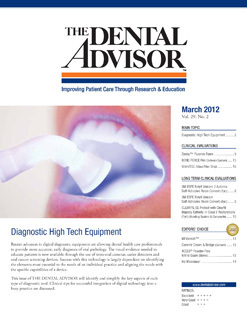 In addition, the NV Microlaser may be used for periodontal procedures, including laser soft tissue curettage; laser removal of diseased, infected, inflamed or necrosed soft tissue within the periodontal pocket; removal of highly inflamed edematous tissue affected by bacteria penetration of the pocket lining; and junctional epithelium. The NV Microlaser diode laser is directly coupled to a lens and aligned to the fiber optic inside the disposable tips, using a two-axis alignment system. Each rechargeable lithium ion battery provides 20 minutes of continuous operation at 1.2 watts of power when fully charged and eight hours of stand-by time. The battery must be fully charged before initial use. Subsequent charging takes one hour. The cradle features LED lights to indicate the amount of charge remaining. The system includes the NV Microlaser main body, batteries, three pairs of safety glasses, base charger (cradle), power supply, two safety keys, wireless foot pedal and 35 disposable tips. NV Microlaser was evaluated by nine consultants in 129 uses. It received a 96% clinical rating. 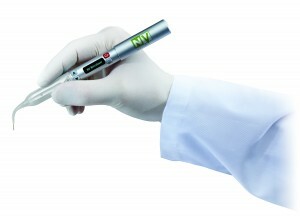 The wireless feature of NV Microlaser makes it portable and easy to integrate into clinical use. The entire system is lightweight and convenient to move among operatories. Set-up is simple, requiring only turning the key in the wireless foot pedal, attaching a disposable tip, and selecting the setting from the menu on the laser. Settings on the menu are arranged by procedure; wattage may be increased or decreased on any of the pre-sets. Generally the power settings are on the low end of the usable range. The batteries in the laser hold their charge for multiple uses, and consultants had no loss of power during the evaluation period. 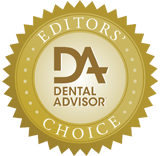 Eighty-nine percent of consultants reported that the NV Microlaser was better than their current diode laser. Eighty-nine percent would switch to the NV Microlaser and 89% would recommend it. Hold the tip at a 45° angle to the tooth for troughing during a crown preparation. For gingival troughing, use a 1.6-1.8 W setting.